FILE - "Africa, the smallest emitter of greenhouse gases in the world, now suffers the most from climate change,” said Akinwumi Adesina, African Development Bank President. Africa cannot be left to foot the bill for climate change, so say leaders and specialists from the continent who attended the recent climate conference in Paris. Nearly 200 nations adopted a historic deal December 12 that aims to slow the pace of global warming and provide billions of dollars for climate change remediation to poorer countries. While it's hard to predict the impact the deal will have on Africa, it's significant that there is recognition of the continent's vulnerability, says Edith Ofwana-Adera, a senior program specialist on climate change for the International Development Research Center (IDRC), who attended the summit. "Agriculture is the backbone of many African economies,” she said. “So what's foremost in the minds of African stakeholders is being able to adapt to the impact of climate on agriculture and particularly focusing on being resilient in cities because cities and economies are urbanizing fairly quickly. “We also need to tackle climate-induced migration; we've seen it happening in a number of countries. Most importantly, also, is improving access to adaptation to financing." FILE - Mejury Tererai, 31, works in her maize field near Gokwe, Zimbabwe, May 20, 2015. Africa has been impacted by global warming and must not be shortchanged by climate change finance, Akinwumi Adesina, African Development Bank President, said at the conference. French President Francois Hollande suggested that developed countries, having emitted greenhouse gases for decades, have a responsibility to help African countries struggling with droughts, flooding and migration. He said the world — particularly the developed world — owes an ecological debt to Africa. He committed France to spending $6.5 billion dollars for renewable energies, a 50 percent increase before 2020. Ofwana-Adera said that Africans and other international organizations have been working on research and technology to counter some of the effects of climate change. "We've had very innovative solutions, such as water harvesting," she said. "We have technologies that help sense soil moisture so that one is able to manage energy and water more efficiently" in Benin, Burkina Faso and Kenya. FILE - Farmers in Africa discuss the expanding use of biotechnology in agriculture. In Uganda, with the collaboration of its environmental ministry, IDRC has been providing adaptation information using mobile phones and radio to communities along the Uganda cattle corridor. 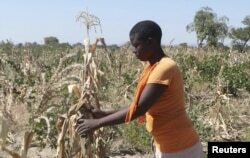 Farmers there receive little or no relevant information to help them cope with drought and other climatic stresses. 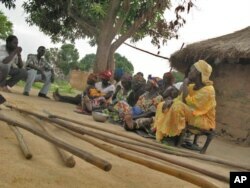 "This is an area that faces up to six months of drought, and we are able to work with the communities in an interactive way to provide information in local language for them to be able to adjust their agricultural practices to meet their needs and to curb climate change," Ofwana-Adera said. "In this instance, we are able to see evidence in reduction in crop loss and damage by up to 65 percent." Assistance has included seasonal weather forecasts and agricultural information localized to the sub-county level; weekly livestock and crop market information to help farmers decide what, when, where and how much to sell; guidance on low-cost rainwater harvesting techniques; and information on drought and flood-coping mechanisms. The greatest challenge, according to Ofwana-Adera, is the accessibility of the funds to make a difference at the grassroots level. Particularly, she says, to ensure that communities are working in partnership with the various stakeholders because communities do have strategies that have allowed them to remain resilient. Finally, she says, there must be transparency to ensure that climate finance is being used effectively.